PS Just this once, Hero Arts will be making more of the kits – this won’t happen in other months, but after we broke the internet, they wanted to reward you for your enthusiasm! You’ll need to be patient since it’ll take some time to get them made again. Happy shopping! After playing off and on for six months (yes, six months! )….I think I can finally nudge this post to the front. It’s too much fun to keep holding onto! Sometimes I’m slow. Seriously slow. And Yupo? This is a paper that brought me to a halt! I’ve been working with it for months off and on, trying to decide if it’s a product that’ll work with cardmakers. And I was nearly ready to say yes, because all the techniques I’ve been learning and trying have been more fine-arts oriented. But I think I’ve got a few ideas baked enough that some of you daring folks are going to fall in love. And some of you non-daring folks are going to watch the alcohol inks and oooh and ahhh til you need some of this paper. I know, I know. Just saying. Watch the video below, or click HERE to see it in HD on YouTube. And then come on back for the cards made with the backgrounds I created! 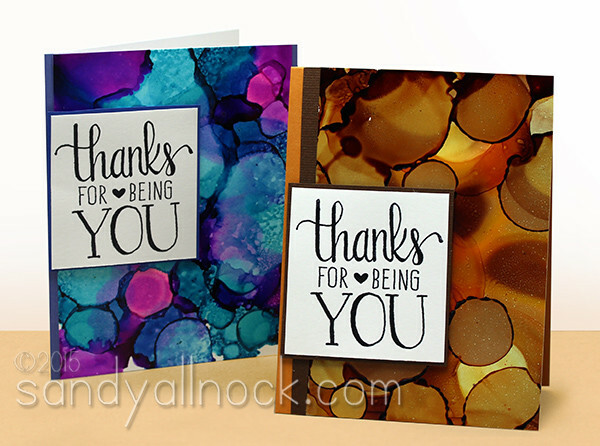 Alcohol inks have always been good on slick papers – but I like them just slightly more, if that’s possible, on Yupo. I’m working out ways to create some paintings with them, since the colors are so intense. Hang tight, more will be coming eventually! Be careful not to put Ranger’s alcohol blending solution in a mister – I’ve been told it has some things in it that would be awful if you inhaled any of it. But for the texture here, colorless blender worked. Since Copic markers are alcohol-based, guess what? The reinkers are too! They also work with the same technique, drops on Yupo. Wait for it to dry a bit, and you can spray on some colorless blender in a mini mister for interesting effects. I found that watercolor on Yupo is much softer in color, and all the brands I tried worked about the same. 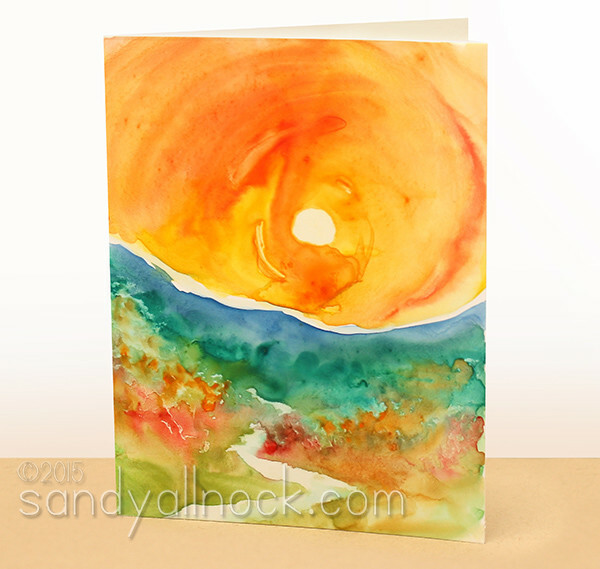 As I showed in the video, you can’t let watercolor pigment build up too much or you’ll end up with a sticky puddle…but here are cards made from the watercolor images I created during the video. This first one features removal of color with a brush to create flowers! I created this scene by layering colors – and being careful not to let pigment puddle too heavily. One more? Sure! How about a leaf, traced from a real one? The color puddled up, and I dabbed it off – and created amazing texture. I removed the veins with a dry brush – very cool look, and I didn’t even have to put anything on the card. Beautiful just as is! One last bit of watercolor – I just had to try Brusho! I dabbed color off, then set it out to dry – and didn’t even recognize the paper when I looked at it the next day! It’s almost a chalky surface – very cool! 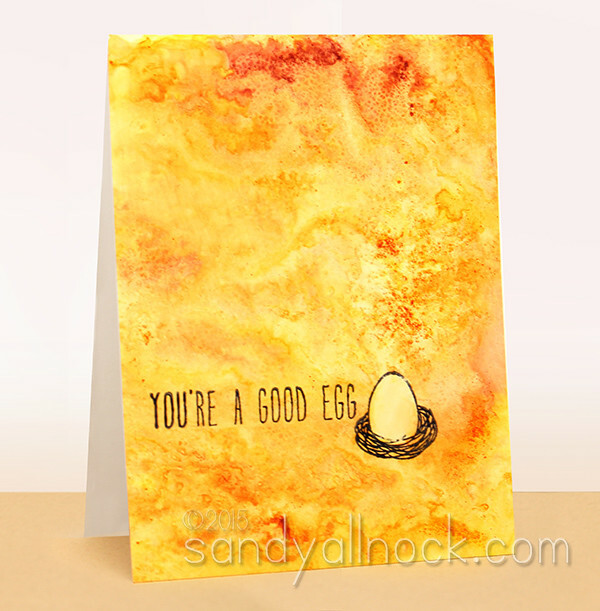 I stamped the sentiment and image – then used a damp brush to remove color from the egg…yes, what a cool thing this paper does, right!? Since I know someone will ask – more testing is still underway on a lot of our usual stamping and inking techniques. Soon I will have a Copic drawing (not stamped) that I did with Copic markers – it’ll be interesting to see how the marker goes on now that you’ve seen what’s in today’s video. But I held off on it til I had this post done, so I’d have something to point to for basic Yupo information. More will be coming on other techniques to use Yupo for. All that said, with a few alcohol inks I blew through a full pad of Yupo. It’s that. much. fun. 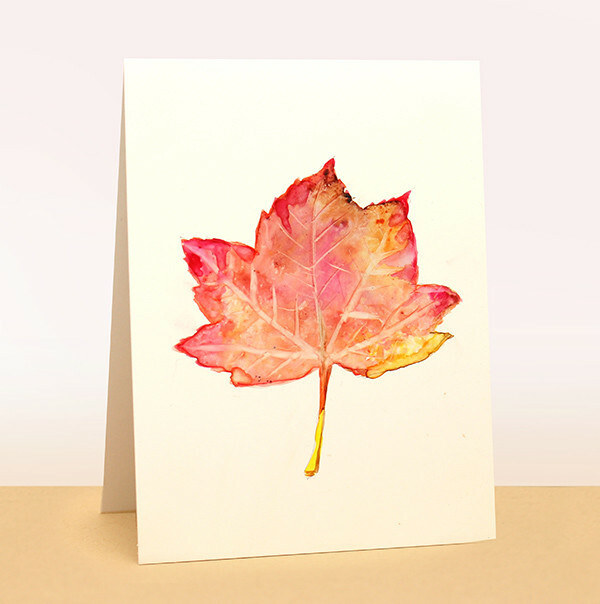 today I came across your you tube post on Yupo paper, loved your backgrounds and really loved your leaves.. 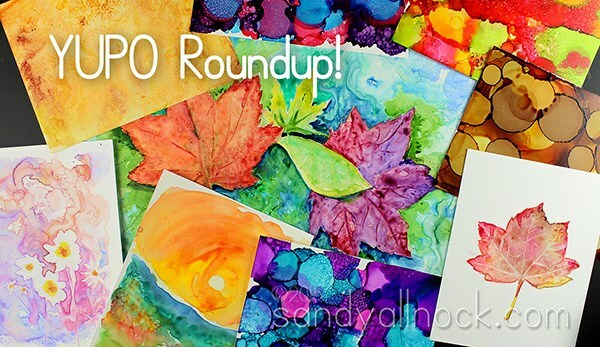 It looked like a lot of fun, watching the shapes form and change…..
sandy, I just picked up some Yupo paper, and am so thankful you made this video! when you were stamping the sentiment, what ink did you choose? is the slick surface of the paper an issue (requiring Staz-On)? I wasn’t sure yupo paper would be fun to work with but you have changed my mind. Thank you for all your fun videos and for opening up my eyes to new ideas. Wow! That paper is amazing. Loved to watch how the inks were travelling and being able to erase any watercolour like you did in your scene (which turned out so pretty) and your leaf seems like magic. Thank you so much Sandy for sharing your skills and knowledge with us!!! I am amazed each time I watch one of your videos!! The Lord has blessed you beyond!! Love these! The watercolor is especially awesome. I thought I had lost my Yupo paper and after seeing your video I tore my house apart and found it! Play time! This paper is fascinating. Looking forward to seeing what other magnificent stuff you do with it! Thank you! Heavens to Betsy lady!! What you can do with this paper is amazing!!! So yes….I will be placing an order forthwith and wait with bated breath for it to arrive. Will be looking forward to your ‘updates’ as well! love to see more about this…. I have a piece of that and now want to go play! Did you seal or finish them with anything? Nope, just used them as they were! I have YUPO and have tried it in the past with watercolors. Thanks for the video and help with this product. Every card is gorgeous – I want to do them all! I bet stencils would be fun to use to “erase” images. Thanks for tackling YUPO… i love playing with it. The leaf card is brilliant. These are really interesting and they explode with color. Thanks for the extensive testing. I appreciate seeing something I can use my Copics with.